Over a month ago, on September 23, I was sitting in front of the TV late that day and surfing the Web. Facebook was down and so I moved to Twitter, like many others. It turned out that Facebook had a rough day performance-wise, with the worst downtime in over four years. During those 2.5 hours of downtime, users turned to Twitter to complain, express their bewilderment, amusement, and frustration, philosophizing, and meta commenting. Joining a community of other Facebook migrants, they turned to each other, or a hashtag, to “see” what was going on. 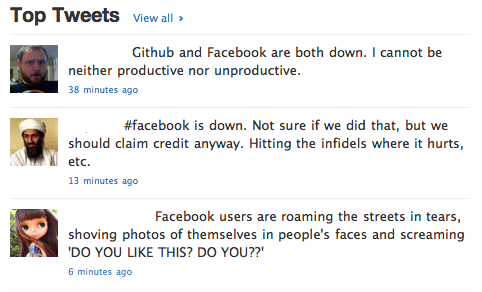 As the San Francisco Chronicle aptly put it, Facebook is down: Can Life Go On? What happened was that Facebook became “present-at-hand” as opposed to being “ready-at-hand” to use Heideggerian terminology. It is when things break down Heidegger suggests, when the tools start to malfunction, that they demand attention and reveal themselves as such. When a thing’s usefulness breaks down it becomes “present-at-hand”, merely there. When things are “ready-to-hand” they are experienced first and foremost through their use function and do not demand our attention for the things itself as such. This is how we normally encounter things, when they work. What happened when people “lost” their dear social networking tool for a while? They turned to the “next” best thing – Twitter. Using the hashtag #facebookdown, users started an intense conversation about the downtime, posting countless complaints about Facebook, its security, privacy and malfunctioning. Not only was the homepage itself down, but the platforms’ API experienced huge problems as well, resulting in a malfunctioning of the numerous like buttons embedded on over 350,000 sites across the web. Hence, when Facebook fails, so do some of the most visited entertainment, information and commercial sites on the Web too. One of the interesting observations coming out of the fail I think pertains to the existential question of What do we do now? An interesting array of tweets illustrated the sudden bewilderment that had befallen the users. Despite the common ironic tone of the tweets, they captured the strange moment quite well. Stuck in a moment that vaguely reminded about a time before social networking, a glimpse of the boredom that one has become so accustomed to covering over with endless stalking, even a revealing of the possibility of a time after social networking sites, what many tweets captivatingly showed was the peculiar ways in which Facebook has introduced a whole new set of vocabulary and practices into people’s everyday life. What do we do when we are deprived of clicking like buttons and pushing out status updates? Maybe we become more productive? The “present-at-handness” of Facebook provoked all sorts of speculations. For instance: what would we do differently if we had the chance? Leaning back for a bit, actually having an opportunity to reflect on what Facebook is and maybe more importantly what it should be. Or it made users think of times before Facebook, of that other social networking account. What was it again? Oh right, Myspace. One failing provoked a reminder of another. Or it made users think of all sorts of conspiracy theories, like it being a PR stunt for the Facebook movie “The Social Network”. Or a suspicion about something new about to come. What Facebook is and what is does to human and social roles, may thus be seen in its Vorhandenheit (occurentness) – the mode of being encountered when things break down and are no longer available, or Zuhanden. Through the dewordling of phenomena, we are able to encounter things as detached from the instrumental world. The practices of status updating, of social networking are stripped of its dazzling effect, revealing to us the unintelligible occurrent of the software platform. I think the top tweets that emerged on Twitter.com that evening nicely summarizes some the occurrent aspects of Facebook: as a space perceived inefficiency and suffering pleasure, a sociopolitical signifier (hitting where it really hurts) and as an ubiquitous absurdity (how did we end up communicating via tagging, liking and profiles anyways?). What more is there to reveal? Next Next post: Code as a creative expression?